Attorney General T.J. Donovan speaking behind committee members. From left: Madeline Motta, Jake Perkinson, Brady Toensing and Josh Wronski. At right is state elections director Will Senning. 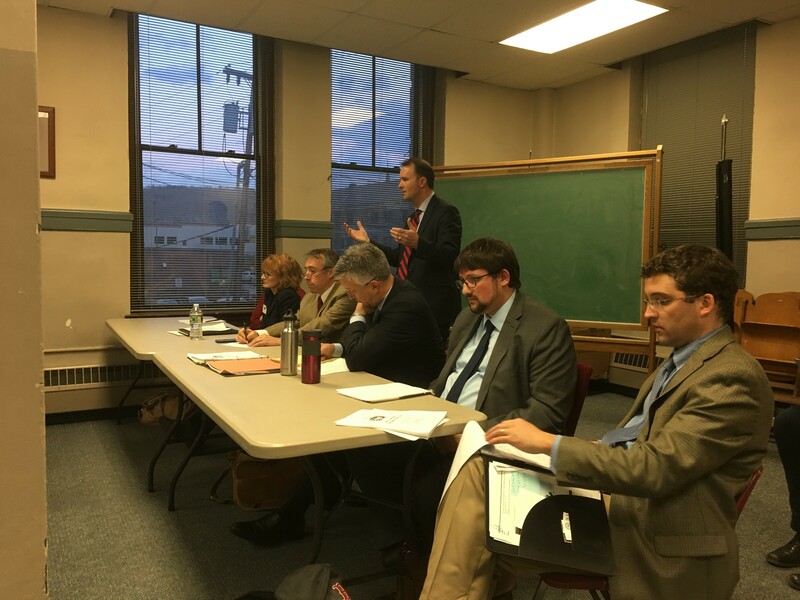 A new committee exploring potential campaign finance reforms held its first meeting Thursday night in Montpelier. The briskly-entitled Joint Committee on Campaign Finance Education, Compliance and Reform was created by Attorney General T.J. Donovan and Secretary of State Jim Condos. They chose to fill the panel with political insiders: Four of its five members are actively involved, or very recently involved, in partisan politics. The event was the first in a series of listening sessions around the state. Afterward, the panel will issue a report, which might include suggested legislation or changes to rules and procedures governing campaign finance in state elections. The committee’s five members are former Vermont Democratic Party chair Jake Perkinson; Vermont Republican Party vice chair Brady Toensing; Vermont Progressive Party executive director Josh Wronski; former governor Peter Shumlin’s campaign fundraiser, Erika Wolffing; and ethics consultant Madeline Motta. She represents the Vermont League of Women Voters on the panel. The discussion was lively and wide-ranging. There were, broadly speaking, three major subjects: Denunciations of the U.S. Supreme Court’s Citizens United ruling, which lifted key restrictions on money in politics; calls for a robust, accessible public financing system; and requests for simplicity and clarity for candidates and party officials seeking to navigate the system. Those disgusted with Citizens United are unlikely to take much comfort in the committee’s work; its task is to find ways to effectively manage political money in a world in which the high court’s ruling is the law of the land. For Donovan, the most obvious answer is to emphasize disclosure and transparency. For many in the audience, the answer is an improved public financing system that could put grassroots candidates on an even footing with those who attract big-money donors. Numerous commenters addressed the many flaws of Vermont’s current public financing system, which is supposed to provide up to $600,000 to gubernatorial candidates and $200,000 to lieutenant gubernatorial candidates who collect enough small-dollar contributions to qualify. But the system is essentially nonfunctional. There is no funding source; candidates are forced to wait too long before formalizing their campaigns; it’s too difficult to qualify for public funds; the rules for publicly-funded candidates are too onerous and inconsistently enforced. From the political pros came complaints about obscure and complicated rules that can leave well-intentioned candidates uncertain how to comply — and a lack of enforcement of the rules that exist. One person said it was inappropriate for the attorney general, an elected official and thus a candidate, to be the ultimate arbiter of campaign finance enforcement. There was talk of an ombudsman or public advocate or, as in many other states, a state ethics commission to be the enforcer. Vermont doesn’t currently have an ethics commission. The state Senate has passed a bill that would establish a weak and poorly-funded commission without any enforcement powers. That bill is awaiting action in the House. Committee members listened throughout, busily filling legal pads with notes. They offered comments of their own. They made no promises, other than to continue listening to anyone willing to show up for a hearing. Donovan could draw some conclusions from the very first event. The committee is likely to make recommendations for the secretary of state and attorney general on how best to manage and enforce current law, and may also recommend new legislation for lawmakers to consider in the 2018 session. One thing’s for sure: If the first hearing was any indication, the panel will definitely get an earful. And whether you see the committee’s members as real experts or foxes in the henhouse, their final report is sure to be unsatisfying for those wishing to overturn Citizens United and get big money out of politics. That is something this panel simply cannot do.